It was at about the 6-hour mark that my team first realized the “thon” in MediaShift’s J-School Hackathon comes from the word marathon. The two-day challenge to propose solutions to problems in our information environment is the intellectual equivalent to running 26.2 miles. This weekend’s event, held at the University of Georgia’s Henry W. Grady College of Journalism and Mass Communication, focused on fact-checking and verification. My team’s thread was video, while other groups tackled problems in data, social media and photos. 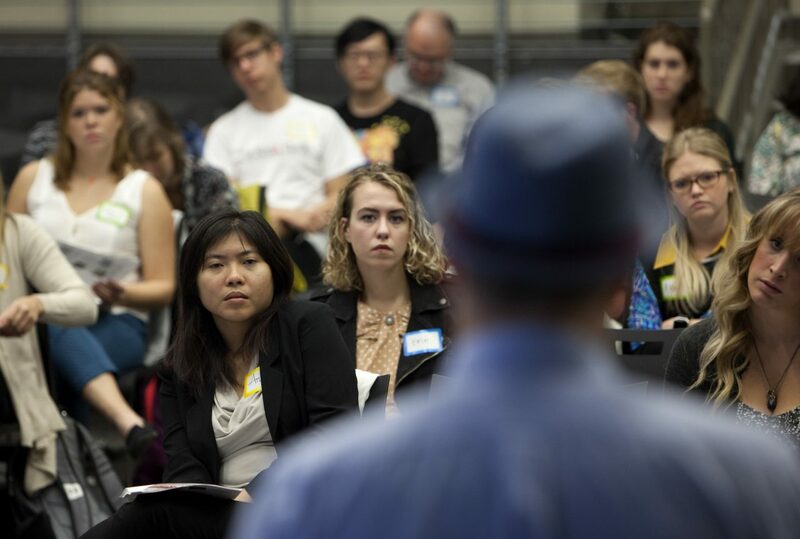 This is the third annual J-School Hackathon that MediaShift has produced (along with three other women’s hackathons), and it lived up to its marathon moniker. It also opened new doors into what it takes to envision an inventive tool to solve problems. “I truly enjoyed being able to combine my journalistic background with the foundation of what it takes to be an entrepreneur and create a start-up,” said Jazmin Goodwin, a Howard University student who brought terrific design skills to my team. Students had no problem seeing right out of the blocks that our information ecology has pollution problems, and fact-checking and verification are keys to a sustainable democracy. But what platform, app or service could they envision that was desirable, feasible and viable – the three criteria dictated by the Hackathon organizers and used by the judges who would determine a winner? My team quickly decided that they wanted to focus less on a tool that could be used to verify video and more on a service that could engage users with verified information while empowering them to participate in key issues affecting them. After noting how politically disengaged they and their peers felt, they landed on a focus on millennials. The research phase of their day unfolded quickly. The team used a Facebook Live session and social media posts to ask others why they are or aren’t engaged politically and how news media affect that. They got all manner of feedback, from the cynical hashtag #killnewspapers to defense of news media credibility in the face of candidate misinformation and disinformation. Information overload, lack of trust, the news agenda and millennials’ retreat from news media combine to disengage them from participating in solving social justice problems. Their solution? Torch: an online and app-based verified video movement targeted at college media. They saw the movement as a way to: “Investigate the facts. Illuminate the truth. Ignite the community.” While they didn’t walk away with the top prize, the frenetic 30-hour dash gave them a whirlwind of experiences. The Hackathon gave them a good dose of the reality of trying to solve problems with media and tech innovations. We began the odyssey exactly where we should have, with a focus on human-centered design. Presenter Jared Bybee, director of Thinc., UGA’s innovation and entrepreneurship effort, walked the students through the steps of design thinking. Students learned that empathy is the essential first step in innovation as Bybee took them through an exercise demonstrating how powerful storytelling can be in learning what problems people face. Only after that exploration, Bybee said, should we move on to the subsequent steps: define, ideate, prototype and test. It was hard to keep our team focused on design as a process, rather than the ultimate product itself. My students kept feeling the temptation to design their tool and service before they had connected with the struggles of their target market and defined the problems facing them. Fortunately, a solid session with a whiteboard and a renewed emphasis on empathy led them to a clear focus early Saturday afternoon. The toughest part of the Hackathon for me was the money. We wanted students to propose these viable startups in verification, yet they needed real-world ideas for how to fund them. At a meeting of all the facilitators Saturday evening, it was clear we all were wrestling with the same thing. When students were proposing pie-in-the-sky funding models that would license their service or technology to newspapers, for instance, we all had the dirty duty of dumping ice water on their plans. With their own fraught business models, news organizations aren’t likely to be in the angel investor business. My favorite element of the Hackathon design was drawing together students from different schools who brought a range of skills to the team. My group relied on the variety of talents they brought, from design to video to coding. When everyone arrived the first morning, we each got a small plastic dinosaur figure, letting us know which team would be ours. I could not have been more proud of Team Iguanodon as they hacked their way from identified problem to novel solution. “The hackathon was an incredible experience that pushed me to my limits — from the high of coming up with the idea to the low of how to make the business idea sustainable. At the end of the hackathon, my team and I came together as colleagues and produced something we could all be proud of,” said Keion Pitts, a UGA student keenly focused on getting our business plan right. In the end, Team Stegosaurus took the top prize with a creative idea called Veridex – a tool to verify user-generated content through crowd-sourcing, metadata scraping and geolocation. As we all departed to return to the 17 schools represented at the Hackathon, participants felt a sense of pride at what they had envisioned and pitched, as well as exhaustion from the break-neck pace of the weekend.